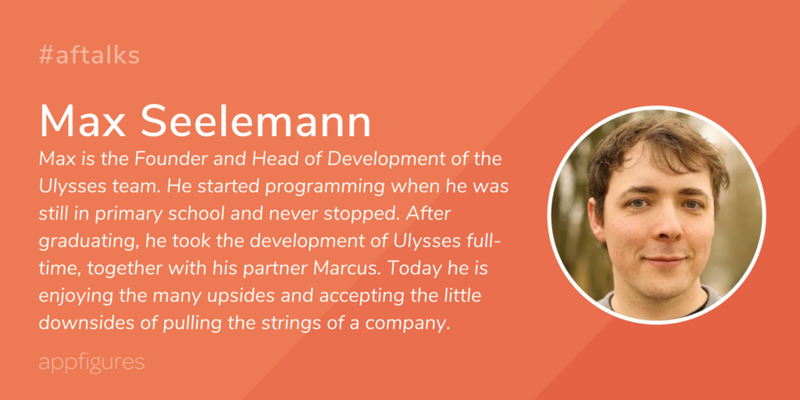 Welcome to our #AFtalks Special Edition recap – App Success Stories! App Success Stories is a new series where we talk to developers about their journeys, motivation, and how they got where they are today so others can learn from their experiences. Q1: How did you come up with the idea for your app? Q2: Did you build/design it yourself or outsource? Why? A: We’re pretty convinced that anything you really care about must be done in-house. While external help can be good, it only gets you to a certain point. Sweating the details is usually too expensive when having to pay contractors, so you just leave it. Only members of a team will put in the passion and long-sightedness needed to build a product to the level of quality that we desire. Q3: What sort of challenges did you face when building the app? A: We’ve been in this game for so long, that I can safely say we’ve faced almost all challenges that an indie can face. We’ve gone through financially dark times, had our serves hacked, shipped horrible software that destroyed user data, lived through stalled development from the burden of other tasks, got sick from exhaustion, and so forth. While none of these situations are things to be proud of, and in hindsight would have been mostly avoidable, I’m proud that we did survive them as a team. And that’s maybe the most important aspect of challenges: you need to learn from them. Ultimately, we are still in the process (challenge) of learning how to best tackle challenges. Try to find smaller or midsize blogs that cover your topic. Email the authors, introduce the app briefly and suggest them reviewing it. Also, most big outlets have public email addresses. Just always email them all your news – they might actually pick it up one day! Q4: Marketing is a crucial element of an app’s success. What does your current marketing plan look like, and how has it evolved since launch? A: We didn’t do much marketing when we started out. We mostly threw it out there, and emailed a dozen or so news outlets and blogs. But again, that’s 15 years back. Our team and the Apple ecosystem have changed massively since. Today, we’re doing quite a few things: content marketing on our blog, we’re curating a monthly newsletter and we have a complex setup for releases. Especially the releases are our main channel of marketing. This is when there is stuff to talk about, so there is a good chance both press and users catch is up and share it with their audiences. We have personal press contacts, who we send (localized) press releases, including a press kit with plenty of information and images. We’re usually creating multiple blog post around a release and engage with our customers on Twitter and Facebook. Overall, I’d say that having a great product is our best marketing asset. This is what causes people to tell other people, and encourages people to write about the app. Q5: Which marketing channels do you rely on for promotion? A: We rarely do any promotions, having seen little effect from them in the past. We mostly just communicate through our blog, newsletter, social channels and personal outreach. Q6: What kind of challenges did you encounter marketing the app after launch? A: The first release is usually not the big problem. Something is new and that’s worth a Twitter or press mention most of the time. The though question is what happens next. Once the rush is over, how do you stay visible? Is someone even using the app after a day or two? Will people talk about changes you make? My answer to those questions would be: yes, if you hang in there and continue to care. Make a good product and continue to improve it. Do not stop. Over time, your user base will grow. Interest in the community will grow. And the mentioned word-of-mouth effect will start to kick in. Q7: If you knew back then what you know now, how would you have approach marketing? A: I’m not sure we’d have done it much differently. There is no point in doing a lot of marketing when there’s no product. So most of our resources went into the product. And once we were able to afford to pay someone for doing marketing, we did it. And only with that hiring, we have really started to focus on all the things I mentioned above. Q8: What is your monetization strategy, and how has it changed over time? A: Ulysses is a subscription-based app. It used to be a paid-upfront app up until this summer, when we made the switch. I’ve written a lengthy post about the why and the how on Medium. The essence is: For a high-quality productivity app, made by an independent developer team, continuous payment is the only sustainable option. And right now the only way to do that on the App Store is subscriptions. Q9: Have you tried experimenting with different strategies and price points? A: We did that with other products which we had before the current Ulysses. We’ve tried freemium, paid with in-app purchases and plain paid-upfront. We experimented with prices and tried various kinds of sales. Overall, I’d recommend to keep your price as stable as possible for most of the time. For paid apps, it’s also okay to increase it with major updates. And then, an occasional sale will work really well. But don’t do it too often, as that will cause people to hold off on a purchase until you do your next sale. And this will destroy the price and worth perception of your product – something you clearly will want to keep high. Q10: When it comes to apps, users play a major role in providing feedback through reviews. Do you incorporate user feedback into planning new features for the app? If so, how do evaluate suggestions? A: We’re bundling all the feedback channels we have – email, social and reviews – and condense every request into a bug ticket. We then track the demand for a particular feature by simply counting requests. Specific details about a feature are also preserved in the form of comments. When looking for new features to implement, these counts and comments are a great help. Nevertheless do we take the freedom to prefer some changes over others and to evolve user ideas into something broader. Q11: Starting something new requires making hard decisions. Were there any decisions that were particularly hard? Q12: How do you measure success? Are there any particular metrics you focus on? Q13: What was the first success you remember for the app? A: I guess the first significant success I remember was seeing licenses actually being sold. For context you need to know that when we started in 2003, I was still in high school. Realizing that anything I built would find people willing to spend money on it was pretty mind-blowing. And to be honest that still hasn’t changed much. Q14: How do you plan on evolving the app and growing its user base? A: Now that we’ve found a stable financial foundation in subscriptions, we are looking forward to making the app better and more capable. The great thing about subscriptions is that there’s no need for infinite or rapid growth anymore, as our best customers are the ones we already have. Our objective #1 is to keep our users happy, and that is best done by enhancing and maintaining what we have, paired with well-designed new features. Usually we don’t talk too much about what we are working on and where the app is headed. Things and priorities change way too often, so much that it’s almost impossible to forecast what we’ll be doing in a few months from now. As an exception from that, my partner Marcus recently shared the features we are currently working on. It’s a first step in opening up our development process, one tiny step at a time. In the future we might even start to maintain a public roadmap, but that’s something still to be decided. Huge thanks to Max for giving us an insight into his journey! 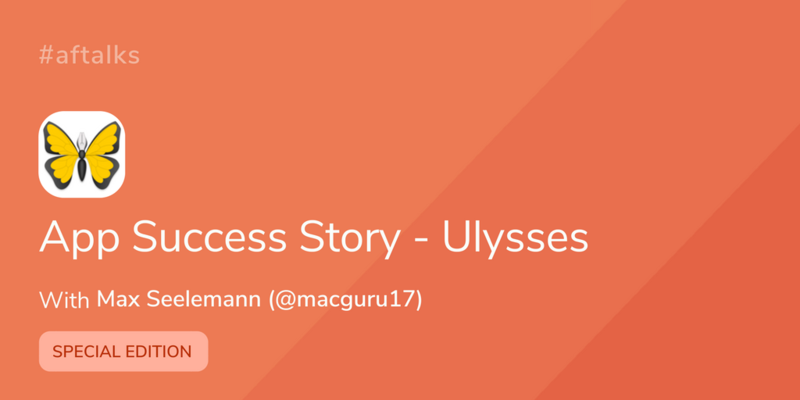 If you haven’t already, go check out Ulysses and start writing! Thank you for the great interview. I use Ulysses all day every day as a management consultant, not a writer per-se. I do find it very helpful as a subscribing user to have a sense for intended roadmap (fully appreciating the diversions from plan). In the traditional fixed price model, the transaction driver is that you pay for something that has already been built and has convinced you of its existing value. With subscriptions, the value proposition is more about funding future development you want to see happen (e.g., Bear was too sparsely featured in the beginning for me, but I recognized its potential and paid). As I have shifted to subscriptions for my favorite apps, I can report anxiety when uncertain that my recurring subscription money is going toward development of anything I care about (e.g., Office365). I also support the shift to frequent, smaller updates. I am not the key target for this app given my use cases (even email is a frequent export destination), but I would welcome more robust support for tables and rich text export control (something between docx styles and their current RT export). I would also appreciate more style control on iPad (where I do most of my writing). In general, Ulysses is possibly my favorite app, and among my most indispensable tools.